Homepage » Android » Android Rooting » How to Update HTC One to Android 4.3 JB CyanogenMod 10.2? The unofficial CyanogenMod 10.2 build was already out for the Samsung Galaxy devices and now it’s available to be flashed on HTC’s flagship smartphone, the HTC One. Though CyanogenMod team is still working on the official CM 10 Custom ROM based on Android 4.3, but the unofficial CM 10.2 test build is available to be flashed on your smartphone. So here is a way to flash and update HTC One to Android 4.3 JB CyanogenMod 10.2. Charge your phone’s battery up to 80%. Backup the complete data of your HTC One as a complete wipe will be required. Enable USB Debugging on your phone – Settings >> Developments Options >> USB Debugging. Your phone must be rooted, unlocked and must have a custom recovery like TWRP or CWM installed on it. Note: The tutorial is aimed at only HTC One and should not be tried on any other devices. Disclaimer: We are NOT the developers of any of the Custom ROMs listed below. Flashing a Custom ROM on your smartphone might prove risky or you might brick your phone. We or the developers are not responsible for any damages done to your device. So proceed at your OWN risk! 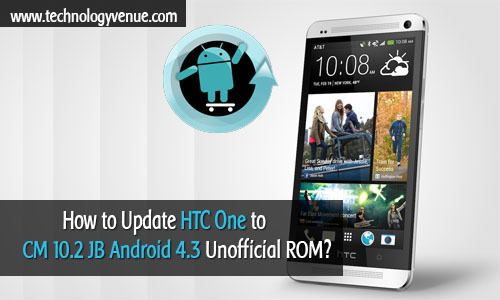 How to Update HTC One to Android 4.3 JB CyanogenMod 10.2 Custom ROM? Also Download the latest Google Apps Package from here. Now connect your HTC One to the computer via USB data cable and copy both the zip files on your device’s internal memory. Perform a full Nandroid backup of your current OS by going to Backup > backup and restore on CWM. Now wipe the data. To do so, in the CWM recovery mode, select wipe data/factory reset and confirm the process. To flash the unofficial CM 10.2 Custom ROM on your HTC One, select “install zip from SDCard” and then select “choose zip from sdcard”. Now locate the CyanogenMod 10.2 Android 4.3 zip, select it and confirm the flashing process. The flashing process will take several minutes, so be patient. Now repeat the complete process to flash the GApps Package on your HTC One. Return back to the main recovery and reboot your device into CyanogenMod 10.2 Android 4.3 Custom ROM. The first boot will take several minutes, so don’t panic and be patient. You have done it. You have successfully flashed the CM 10.2 ROM on your HTC One. That was the complete process on how to update HTC One to Android 4.3 JB CyanogenMod 10.2 Custom ROM. I would love to see your feedback on this topic. If you have flashed the ROM or are facing any problems when you update HTC One to Android 4.3 JB CyanogenMod 10.2 Custom ROM, then do share it with us and we will try to solve it.